Liz Rideal: Mandrake Tango/Works 1992-2002 presents the work of this British artist who, for the past 15 years, has made the photo-booth her primary means of expression. She creates sensuous abstractions constructed from the photo-booth strips or will sometimes enlarge certain sections of the strips into multi-paneled photographic murals. The images are either of variously colored and textured fabrics that Rideal tosses into the booth while the camera shoots the material’s fluttering downward sequence, or of arrangements—and rearrangements—of floral and vegetal matter. In addition to a selection of her photographic pieces, examples of the artist’s monotypes will be exhibited in juxtaposition to her most recent venture into the sculptural medium, which consists of small bronze casts of upside-down roots. Mandrake Tango is on view from September 14 through October 25 and an opening reception will be held on Friday, September 13 from 5 to 7 p.m. Ms. Rideal will be present at the opening and will speak about her work the following day on Saturday, September 14 in the Gallery at 3 p.m. All are welcome to attend. Rideal uniquely combines a number of methods and interests from past sources such as Surrealism’s fascination with the machine, an intentional invitation to the contributions of random chance and found objects, the minimalist proclivity towards the grid format, and post-minimalism’s swerve toward process and the mutable. However, Rideal’s work speaks less of a concern with the means engaged or the integrity of the material, and more of the distillation of those means and that material into a sense of the purely luscious. This sense is summoned in part from our associations with fabric—its presence usually signifies something forbidden or exclusive, anticipated or magical. Even more entrancing is its role to cover and reveal simultaneously. Historically, of course, fabric has had a tacit though important place in subjects for painting and sculpture. It is coincidental that the exhibition Fabric of Vision: Dress and Drapery in Painting was on view at the National Gallery in London this past summer. The premise of the exhibition, curated by the American art historian Anne Hollander (best known for her book Seeing Through Clothes), is that the representation of fabric is central to the way that artists express emotion and create drama. Concentrating on the Renaissance, 19th century Romanticism, and the 20th century, Hollander believes that fabric in art "reflects every era’s fashion, power, social status and taste as well as sexual mores." Ms. Rideal was a guest speaker at the recent conference held in conjunction with Fabric of Vision. < Rideal has had a long, on-going relationship with things of the botanical sort, from tending her own garden to incorporating plants and flowers into her work. She is most pleased to be showing for the first time a series of bronze sculptures inspired by and taken from roots that she dug up while weeding. 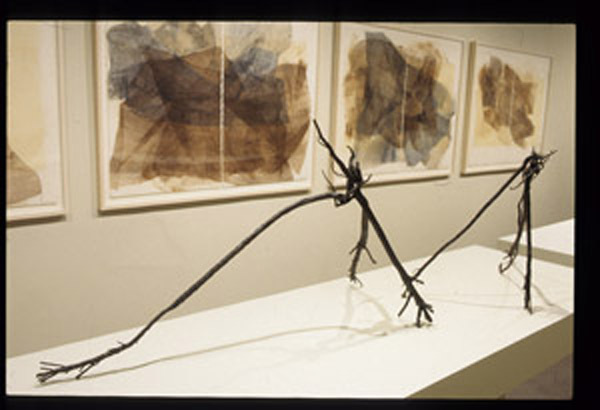 Rideal has arranged these sculptures in the North Gallery with examples of the monotypes that she printed last year at Aurobora Press in San Francisco. The artist has said that her purpose is to "investigate how the creative process is enhanced and revealed by exhibiting a series of works connected by the subject matter yet explored in different media." Liz Rideal was born in 1954 and lives and works in London. She has been actively exhibiting her work in both one-person and group exhibitions, mainly in Great Britain and Europe, since the early 1980s, and has also curated several exhibitions at the National Portrait Gallery, London. Examples of her work are held in many private and public collections worldwide such as the Bibliothèque Nationale, Paris; the Henry Buhl Collection, New York; the New York Public Library; The Seagram Collection; and the Yale Centre for British Art, New Haven. Ms. Rideal teaches at the Slade School of Art, London. 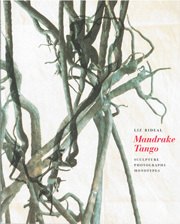 Liz Rideal: Mandrake Tango is the artist’s first exhibition in an American museum. A catalogue published in conjunction with the exhibition contains several poems by Emily Dickinson; essays by Judy Collins, former Curator of Sculpture at the Tate Gallery, London, and by artist, critic and writer Emmanuel Cooper; and a poem written specially for this occasion by critic and poet Bill Berkson. 8.25" x 10.25"; 48 pgs, 48 illus.